The philosophy of the Department of soil science programma generally centers on producing graduates that are well veres in sustainable agricultural production,environmental quality control and sustainability.The department believes that rapid changes in scientific approaches to soil studies and environmental issues,including climate changes impact of land qualities,can only be well addressed by adequate enhanced university university training soil science and land management.Thus ,the department of soil science is currently on the course of formally modifying its name(to department of soil science and land resources management)and updating its program. The department was formerly part of the department of SOIL PLANT and SOIL SCIENCE from 1961 to the end of 1972/1973 academic session,and later became a full-fledged department in1974.The degree B.SC (PLANT/Soil Science)was awarded in 1973.This was changed to B.SC(Soil Science)as from 1974.There was a change of curriculum in 1978 which saw the undergraduate education in soil science changing from four year programme to a five year programme, following this change,the university has been awarding undergraduate students of the department,on completion of their academic programme,the B.Agric. (Soil Science)Degree starting from those who graduate five years after the change in curriculum.precisely in1982.This new programme requires student from five of the department in the faculty of Agriculture(Agricultural Economics, Extention,Animal Science and Soil Science)to offer a common mix of courses in the first three year of the programme after which they would engage in a full year of practical farming and subsequently specialize in their individual field of study during the fifth/final year. Postgraduate Programme offered by the department includes:Postgraduate diploma in Soil and water,masters and PHD.degrees.Areas of climate change issue,biogeography,forestry.and waste management are pedology,soilgenesis,soilsurvey,classification and evaluation,soil physics,soil chemistry,mineralogy,biology, biochemistry,soil and water conservation,and fertility management(agronomy). The discipline of the soil science in Nigeria and its contribution to national agricultural growth and environmental conservation cannot be discussed in isolation of the contribution of this department. 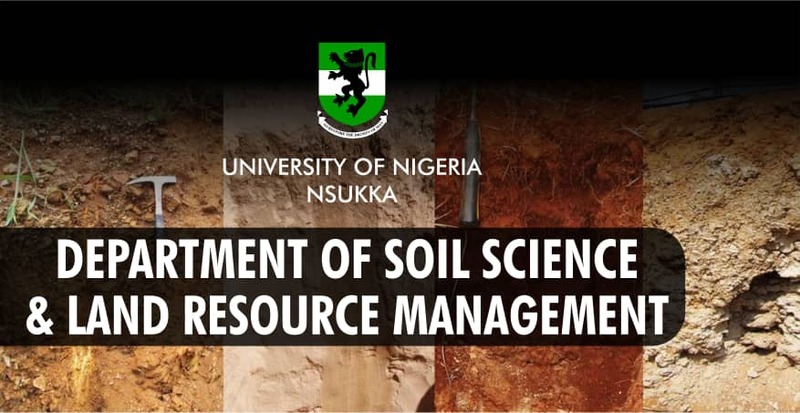 The Objective of this write up therefore is to highlight the historical development of the deparment and briefly discuss its contribution to sustainable use and management of soil science resources particularly in Nigeria and in general other sub-Saharan African Countries. The main objectives of the department are to provide broad pratical and theoretical trsining in the basic agricultural science and land management which are relevant in Nigeria in particular and the world at large,and to produce higly skilled graduates who have acquired the knowledge needed to meet the agricultural,development and environmental needs of Nigeria and beyond.The departmental academic programme is developed based on the need to meet the nation drive for inceased food production,and effective transformation of agriculture as well as the promotion of sustainable use of soil,land and water resources.Theprogramme aims specifically to :1 produce graduate with skills in soil and land management for the increasing the productivity of agricultural lands while maintaining sustainable environment,(ii)produce graduate well versed in soil resources and water conservation techniques for sustainable land use and management,(iii)produce graduate with adequate knowledge and skills for research and development in soil and land management, environmental sustainability and quality control(iv)produce graduate with adequate knowledge of remote sensing techniques and (v)produce graduate with theoretical and pratical knowledge of the use of Global Positioning Sysytem instruments in land management and climate change research. The soil science and land management programme captures its three main roles in agricultural production, environmenttudies and management of soil resources.Theprogramme covers various aspect of land management, land evalution,rnvironment,geographic information system(GIS)climate change issues,biogeography,forestry and waste management are pedology,soilgenesis, soilsurvey, classification and evalution,soilphysics, soilchemistry, biology and fertility management.